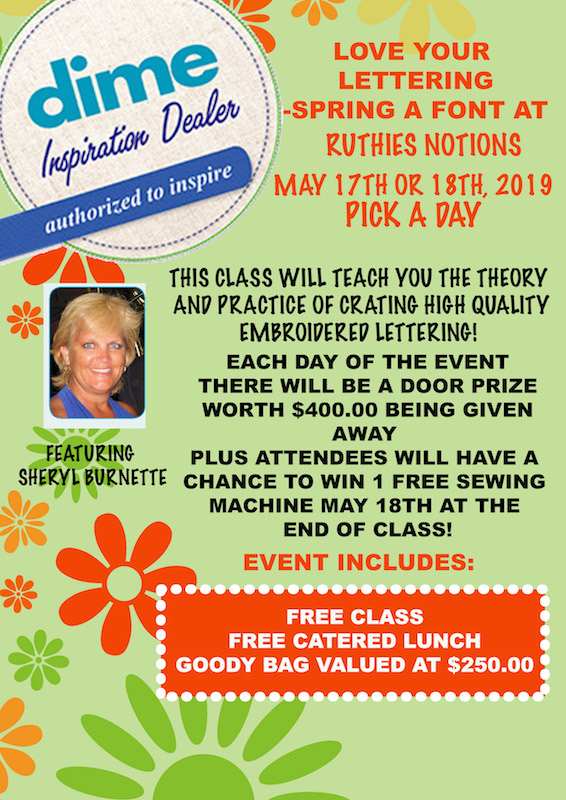 Ruthies Notions in Baker FL is planning some of the very best Make It and Take It classes and lecture demos with the absolute best teachers in the industry today! We only list classes a few months in advance. Sign up early as classes fill up fast!! 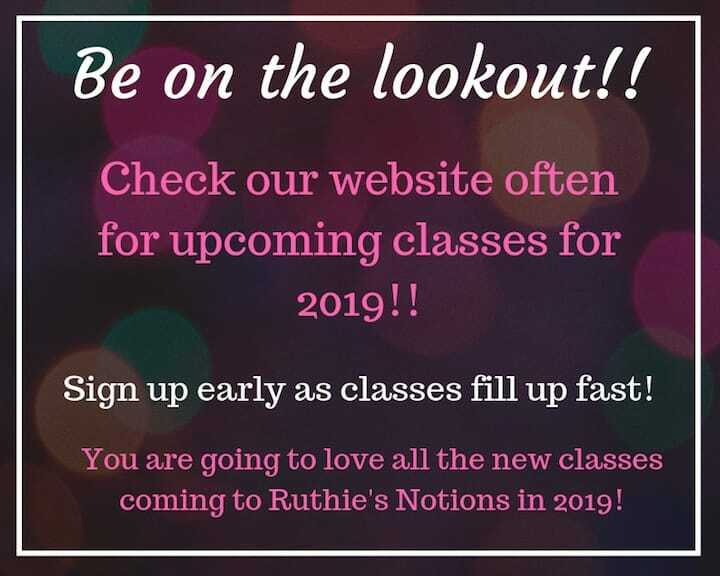 You are going to love all the new classes coming in 2019!! To sign up for any of the following classes just simply click on the “Register” link under the class. Ruthie’s Easter Celebration with Joan Clemons on April 9th, has been canceled. Sorry for any inconvenience. It’s time for another make it and take it sewing and embroidery class with Mike Johns!! 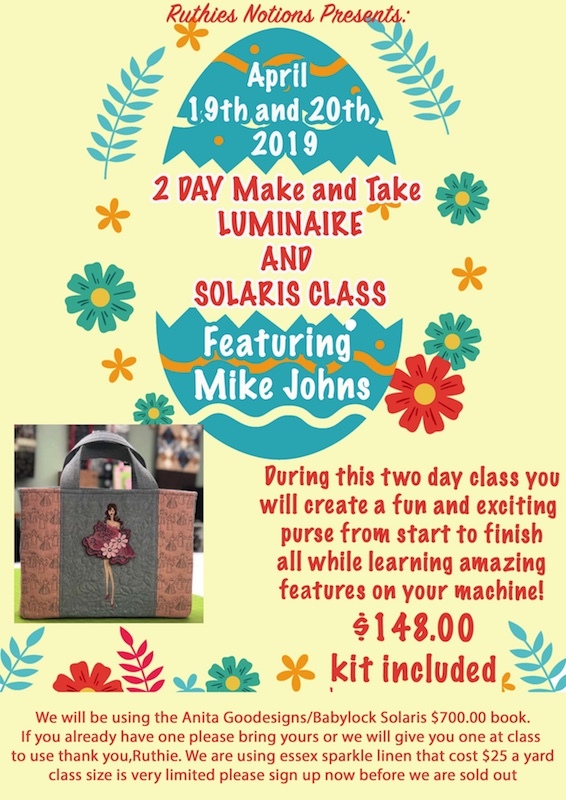 During this two day class you will create a fun and exciting Lace Fashion Figure Bag project from start to finish, all while learning about the incredible features of the Baby Lock Solaris, Baby Lock Destiny 2, Brother Luminaire and Brother Dream Machine 2. Mike will guide you step-by-step through the project making sure you have fun in the process and never leaving anyone behind. Each attendee will bring his/her Solaris/Luminaire/Destiny 2/Dream 2 along with supplies below. All other materials needed to complete the project will be provided in the class kit. Sewing Supplies – Each student will need to bring basic sewing supplies (scissors, snips, seam ripper, bobbins (you will need empty bobbins and white pre-wound bobbins), etc.). You may find it useful to have a rotary cutter and ruler as well. You should also bring pins and/or mighty clips. You will need your embroidery arm, embroidery foot, 9.5”x14” or 10 5/8” x 16” embroidery hoop, sewing foot (you can use the J Foot or the Digital Dual Feed Foot), power cord, and foot pedal. The cost of this two-day class is $148 and as always a delicious catered lunch will be provided each day. The finished bag measures approximately 11” H x 15” W and 3” D (the perfect size for most laptops). The back of the bag has the same three panels as the front but without the Lace Fashion Figure. Reservations are required for attendance and space is extremely limited to be sure to secure your seat today! With a touch of the modern quilt come learn how to piece and quilt It on all the serger. You will love to get 1/4″ seam as well as using decorative thread to add dimension to your quilting. To Make the collection complete we will serge a decorative pillow with piping a zipper! Class is $88 and includes your kit! Sign Up Today! Seating is Limited!! Embroidery 3-day business workshop featuring the brother Entrepreneur Pro X, Persona, and 6 needle Entrepreneur 6 plus. 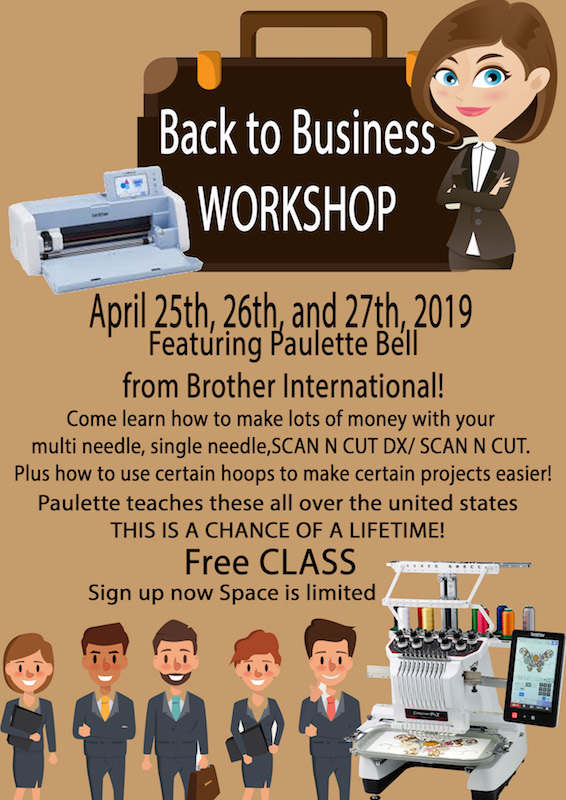 paulette teaches workshop all over the country on how to do a business with these awesome brother machines. This is a chance of a lifetime thanks to brother international for sending Paulette to do this class to help our customer. Paulette will teach you how to use the specialty hoop on the multi-needle and single needle. Paulette will teach you how to use Durkee hoops plus several other hoops including the cap jig and sleeve hoop. Paulette is wonderful in the single needle and multi-needle machines don’t miss a day every day is different and exciting. Sign up today!! Seating Limited!! 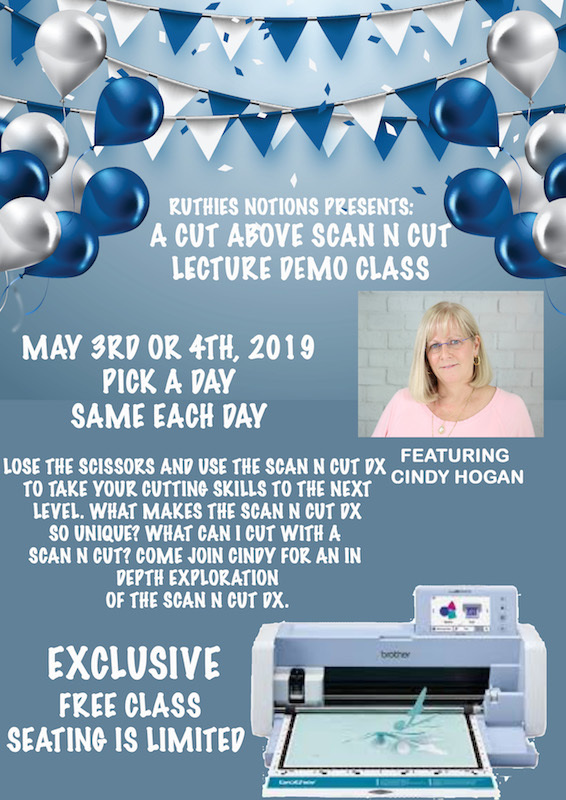 Ruthie’s is having an exclusive Scan N Cut Lecture Demo Class featuring Cindy Hogan. Cindy Hogan is one of the best teachers in the world today! Lose the Scissors and use the DX to take your cutting skills to the next level. What makes the ScanNCut DX225 so unique? What can I cut with a ScanNCut DX225? 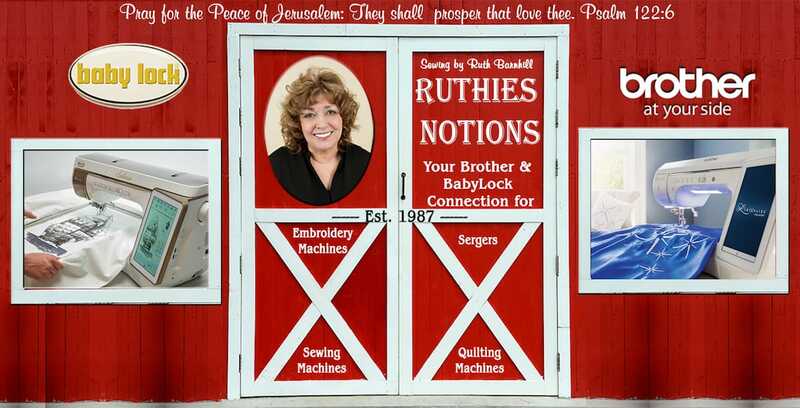 Come join Brand Ambassador Cindy Hogan of Cynthia’s Embroidery for an in-depth exploration of the ScanNCut DX225 machine at Ruthie’s Notions. 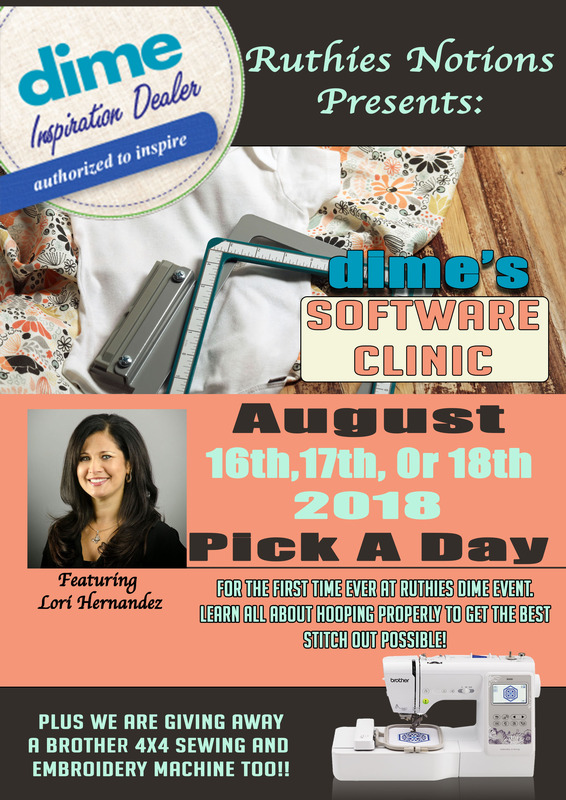 This unique Lecture/Demo class will walk you through using the ScanNCut machine to cut fabric, vinyl, heat transfer materials and more. Learn how to layer adhesive vinyl, create Rhinestone designs and more. Cindy will demonstrate the unique features of the machine, CanvasWorkspace and how BES4 can assist you in designing for the ScanNCut DX225. Cindy works directly with Brother International to help with the teaching and creating awesome ideas you can do with the Scan N Cut DX and Scan N Cut. She also has awesome ways of using all the different software BES4 and both upgrades PE Design. Cindy has used PE Design since it came out and now it works excellent with the Scan N Cut DX. Leave feeling confident to open up the ScanNCut and begin cutting your own designs! Cindy resides in Tennessee with her husband. She has a BS and MS from the University of TN in Special Education and was a full time Special Education teacher until 2003 when she decided to change career paths and use her knowledge of PE-DESIGN® and Education to be a freelance Product Training Specialist for the for all Brother Software Programs. Cindy is an internationally recognized Brother Software expert. She began working with the PE-DESIGN® software when it was first introduced and began teaching all Brother Software thereafter. She is also nationally recognized as an expert on the Brother Scan-N-Cut and machine embroidery. She teaches classes on the Craftsy Platform and has been a guest instructor on the Hit TV Show “It’s Sew Easy”. As a Brand Ambassador for Brother she loves sharing her knowledge of embroidery with others and helping her students learn to take their craft to the next level. SIGN UP TODAY! Don’t Miss Out!! 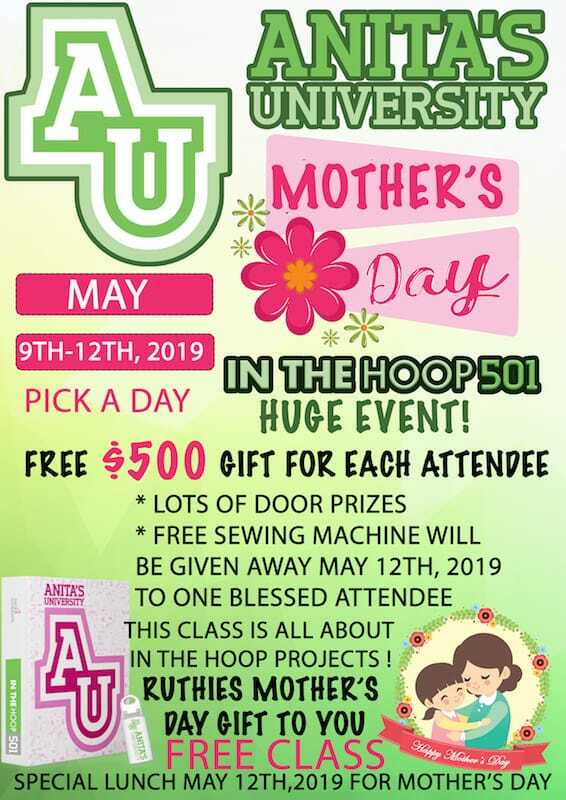 Join us May 9th – 12th at Ruthie’s Notions for Anita’s University HUGE EVENT! This class is all about Hoop Projects!!! And one blessed attendee will receive a FREE SEWING MACHINE on May 12th! Sign up today for all days!! FREE CLASSES!! Seating is Limited! 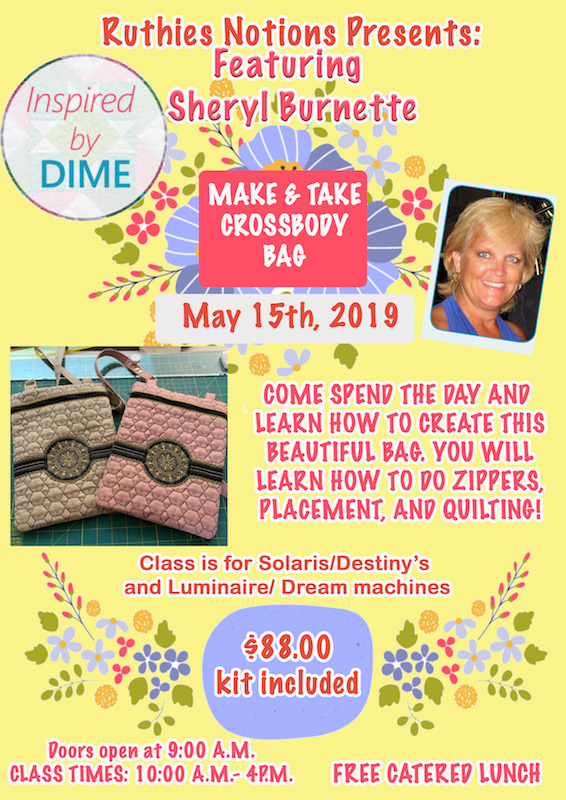 Join us on May 15th and create a beautiful Cross Body bag. Spend the day creating this beautiful bag. Learning new techniques and enjoying the process. 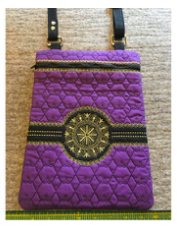 You will learn how to do zippers, placement, and quilting. We will complete this cute purse in class. Bring your machines,9×14 hoop and normal sewing supplies. Everything needed for this purse will be included in the kit. Note: Purse color materials will be different. Come have some fun. Sign Up Today!! 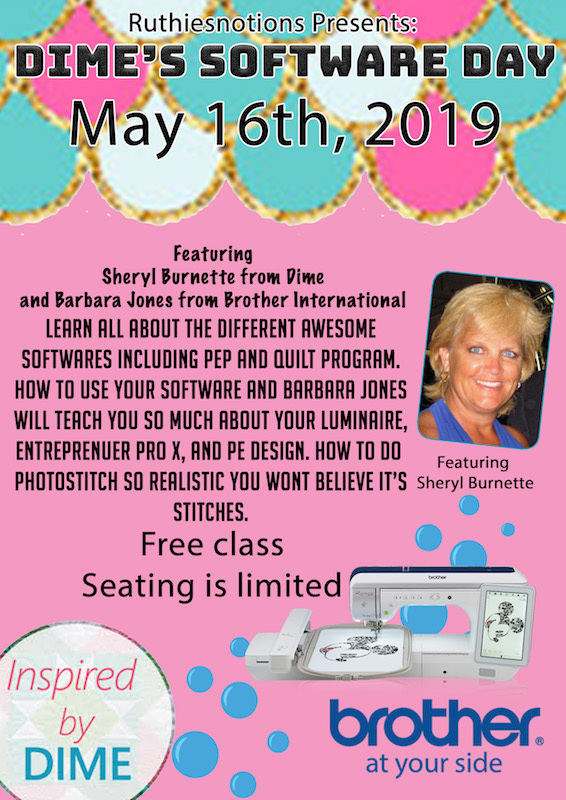 Join Shery Burnette from Dime and Barbara Jones from Brother International and learn all about the different Dime Softwares including Pep, The Quilt Program and how to use your software. Barbara will teach you so much about your Luminaire, Entrepreneur PR1050 and PE Design. She will also show you how to do photo stitch that is so realistic. This class will teach you the theory and practice of creating High Quality embroidered lettering! Each day of the event there will be a door prize worth $400 being given away! Plus! Attendees will have a chance to win 1 FREE sewing machine on May 18th at the end of the class. This is a FREE class and a free catered lunch will be provided. Create a fun and exciting project from start to finish, while learning about the incredible features of the Baby Lock Solaris and Destiny 2, and the Brother Luminaire and Dream Machine 2. For everyone that has been asking for a Make It & Take It Palette 11/PE Design 11 class . . . this ones just for you!!!! You will only bring your laptop everyone that has been asking for a hands-on Palette 11/PE Design 11 class . . . this ones just for you!!!! Join Mike as he teaches you how to use these incredible programs to digitize your very own design from start to finish! Each attendee will bring his/her laptop to use in class and an empty memory stick (thumb drive). Palette 11 or PE Design 11 must be loaded and ready to use prior to class. Additionally, each attendee should have basic working knowledge of his/her computer and be familiar with basic computing terms (left-click, right-click, click and drag, copy, paste, etc.). 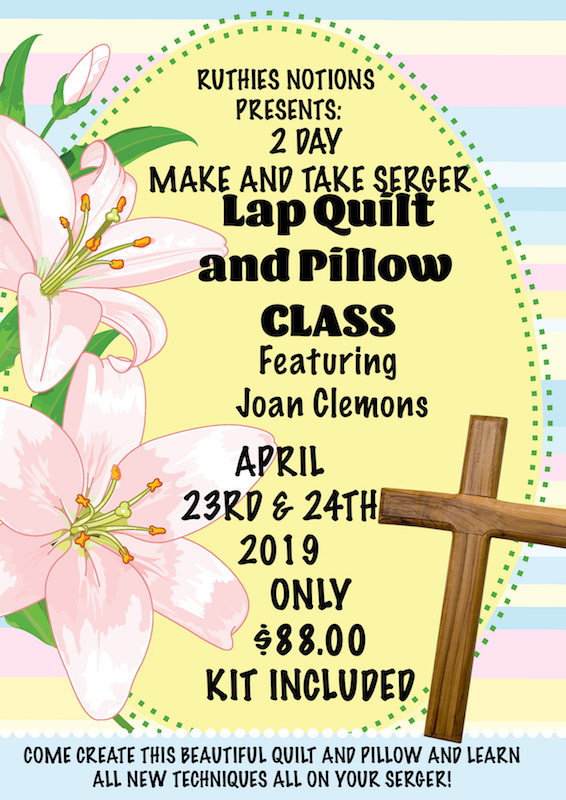 Everyone will bring his or her embroidery machine (all Baby Lock and Brother embroidery machines are welcome as long as they have a minimum sewing field of at least 5”x7”). Attendees will also bring their own basic sewing supplies and thread (required colors will be posted prior to date of class). A kit containing all other supplies needed to create the projects will be provided. Class is only $44 and includes the kit. A delicious catered lunch will be provided. Seating is limited so make sure to reserve your spot as soon as possible. 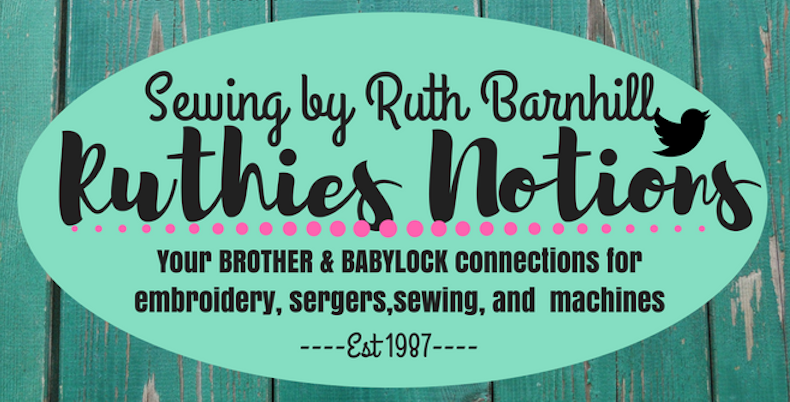 Do you own a Baby Lock or Brother Multi-Needle or Free Arm Embroidery machine? Maybe you are just curious to see what all they can do? This class is just for you! 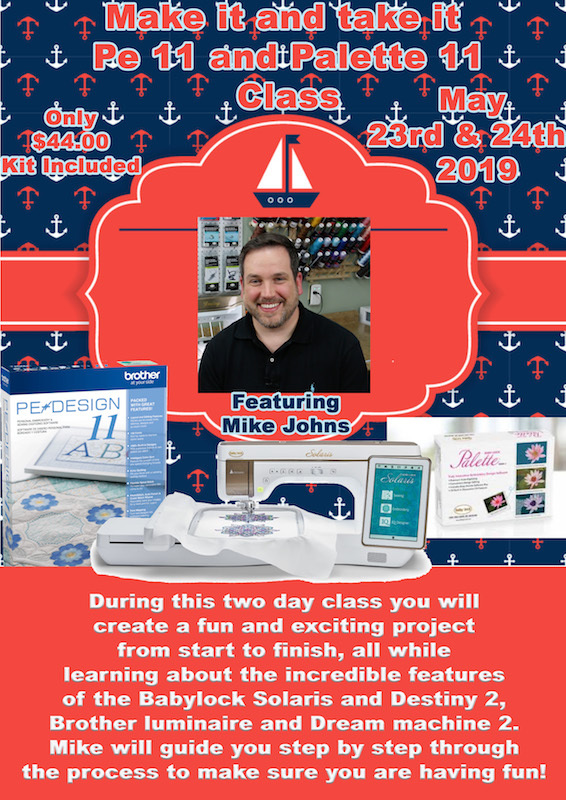 Join Mike Johns as he shows you all of the incredible features of the Baby Lock and Brother Multi-Needle/Free Arm embroidery machines. 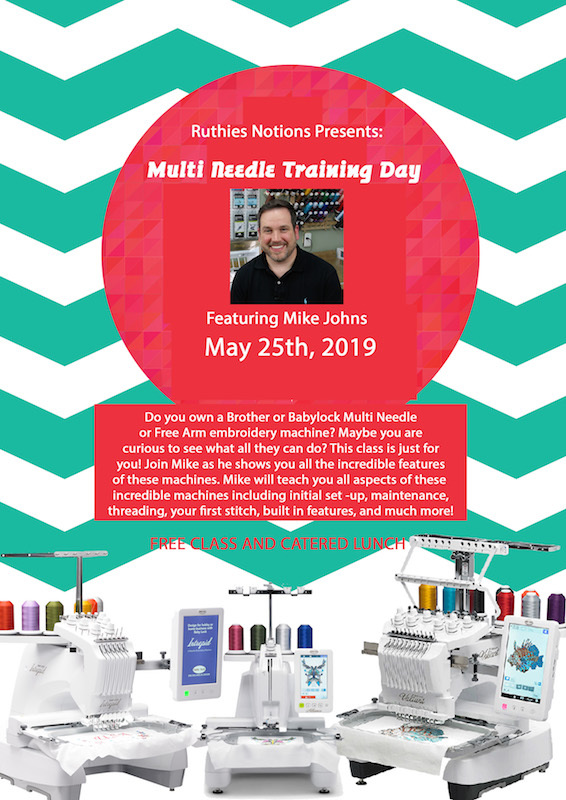 Mike will teach you all aspects of these incredible machines including initial set-up, maintenance, threading, your first stitch, built-in features, and much more. Everyone from the newest embroiderer to the seasoned expert will learn something! This is a free class and includes a delicious catered lunch. Are you scared to touch your multi-needle? FEAR NO MORE! Joan will take you to new and comfortable lengths than ever before on the multi-needle. 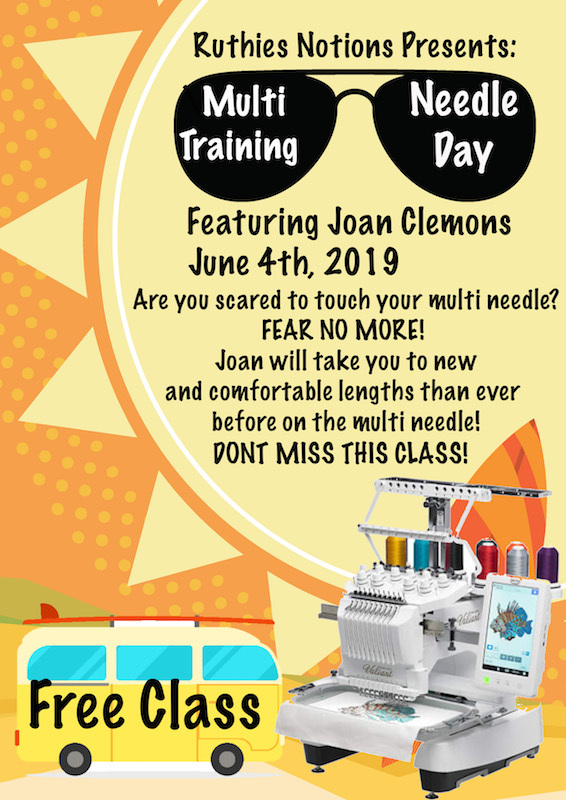 Even if you do not own a multi-needle and want to get one this is a perfect class to see how easy and fun these machines are for any project! This is a FREE Class! Sign Up Today!! Have you ever wondered what a serger will do? Are you afraid or intimidated by your serger? If the answer is yes, then this retreat is for you. 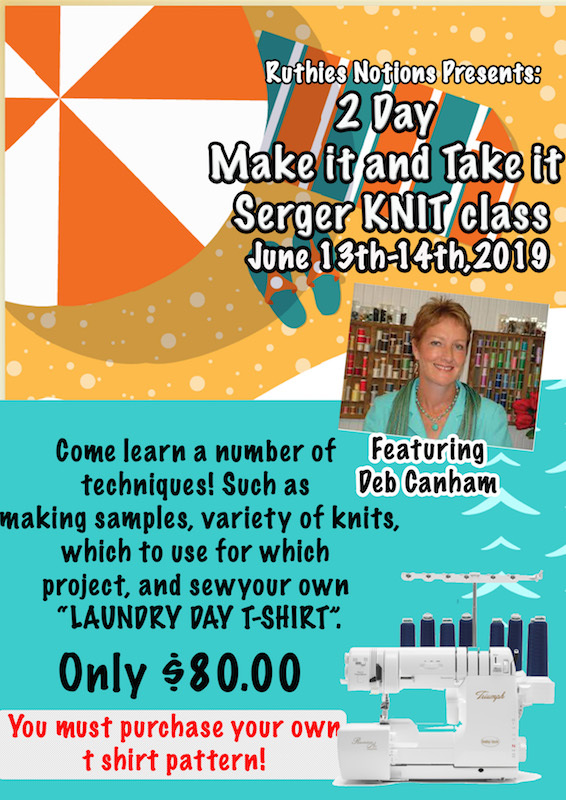 Whether you already own a serger or you are in the market for one, this class is worth its weight in gold! You will walk away with education and inspiration that will last a lifetime. After three days of in-depth serging, you will go home with a reference book of 30 stitched samples that you will refer to for many years to come. This retreat will take you from start to finish by exploring both basic and advanced techniques. By utilizing many of the available feet and attachments, you will be inspired to apply these techniques to future projects. 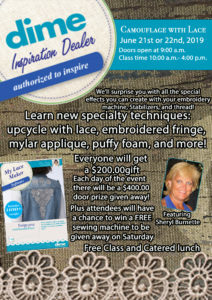 Here are just a few of the techniques that will be shown: flat-locking, gathering, zipper installation, piping, serger crochet, serger cover hem, bias binding, plus many more. You will learn how to start, stop and easily remove a serger seam. Learn how to stitch corners, curves and how to stitch in the round. Don’t miss out on the helpful hints, tips and serger samples! If you do not own a serger, one will be provided for you. Even if you own another brand, one will be provided for you. If you own a Baby Lock Evolution, Ovation or Evolve bring your machine and learn how to make the most out of your serger. 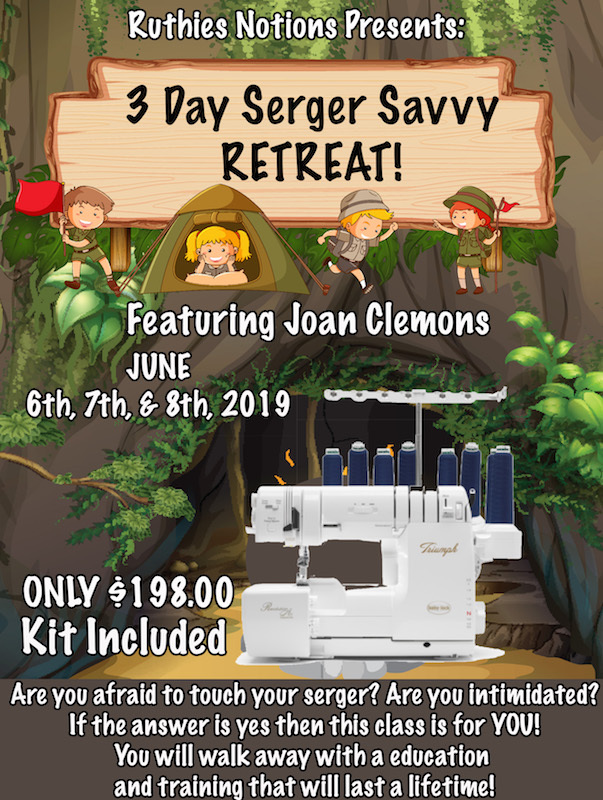 Come and find out why a serger will make your sewing experience a fun, functional and creative endeavor. This class is free and you get a free catered lunch. Each day is different and exciting. 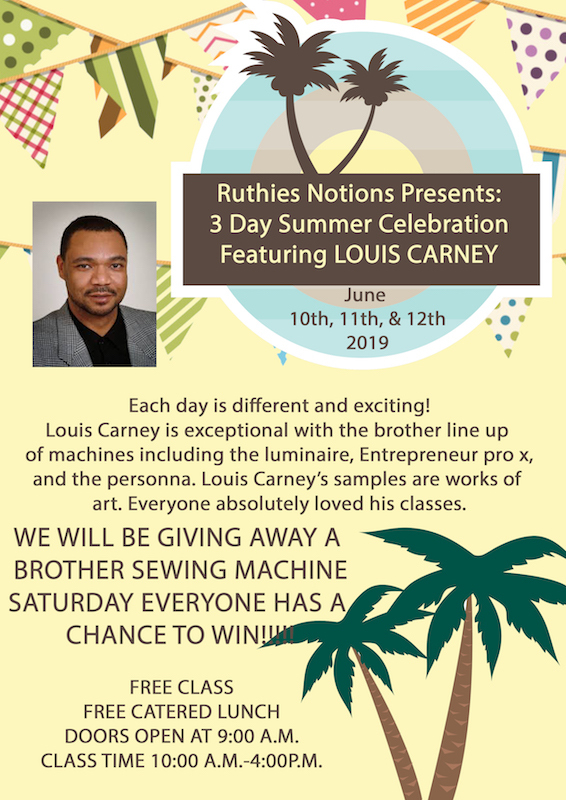 Louis Carney is exceptional with the Brother line up of machines including the Luminaire, Entrepreneur Pro X, and Persona. Louis Carney samples he will show are works of art. Everyone absolutely loves his classes. You do not want to miss a thing. Louis Carney teaches you so much our customers loved the last 3-day class we had. We will give away a free brother sewing machine on Saturday! Everyone has a chance to win. Louis began his sewing career at the early age of 12 in his hometown of Kansas City, Missouri, where he studied tailoring, design and visual merchandising in an advanced curriculum at Lincoln Academy Prep school. After college, he began his career in the sewing machine industry, working in Chicago and New York City where he now resides. He has worked with most major machine brand companies and has familiarity with all brands of machines. Louis has taught in all 50 states and Mexico, lectured in London and worked with machine product development in Sweden. With a focus on interiors, his special attention to detail, congenial class atmosphere & beautiful samples, his classes always fill to capacity. His familiarity with machine products and industry knowledge ensures a fun and informative time to be had by all. Design influence utilizing embroidery software, segers/coverstitch, TOL embroidery machines, multi needle embroidery machines and long-arm quilting machines, are some of his favorite past times. “Creative Sewing Techniques by Machine” and “More Creative Sewing Techniques by Machine,” both published by AQS are books Louis has contributed to with fantastic step by step projects! He has appeared on the television/web shows: America Quilts Creatively, Now Sewing, America Sews, Sew it All, It’s Sew Easy, Sewing with Nancy, Behind the Seams and many local TV news reports. Artistic, Elna, Janome, Brother and Kreinik Threads Mfg, Youtube videos/demos and webinars. Mr. Carney has an illustrious list of clients, including, but not limited to: Bernadette Peters, Sara Jessica Parker, Tommy Mitolla, Dr. Ruth, Mary Fisher, Nancy Wilson, the Rockefellers, Kristina Wildentstein, Kathleen Glynn (Mrs. Michael Moore), Mrs. Sidney Poitier, Martha Stewart Inc and Vera Wang Inc., as well as the Broadway musicals productions of “The Lion King” and “Riverdance. He has also worked with an artist for Addidas. Magazine/newspaper credits: Architectural Digest, Time Out New York, Pfaff Club Magazine, Town and Country, The New York Times, Creative Expressions, Creative Machine Embroidery, America Quilts Creatively, Sew News, Sew it All and many more. He has also served as a film consultant to MGM studios for the sewing machine industry. Day 1 will include completing a number of Knit techniques and making samples. Learning about the variety of knits and which to use for which project. NOTE: Read through the page and you will see that you have the opportunity to purchase this pattern for free with a discount code if you join their Facebook pattern community. You will need to place the discount code in the box when you check out from buying the pattern. You will then get the opportunity to download 2 files. One is for a large printed pattern that you can take to Staples and have printed. The other file is for the regular printer size pattern which you will print on your home computer on letter size paper and join together before cutting out. This will show you how to print the pattern in one size rather than all the sizes in the file. You will need 4 cones of matching serger thread. If you have the Knit Woven Double Fold Bias Binder in size 15mm (BLCS-DFBB15) bring it to class. If you have my `Working with Knits Book` also bring it to class. Bring your serger, knife table and Cover and Chain stitch table and all the feet that you have. Sign Up Today! Space is Limited!!! 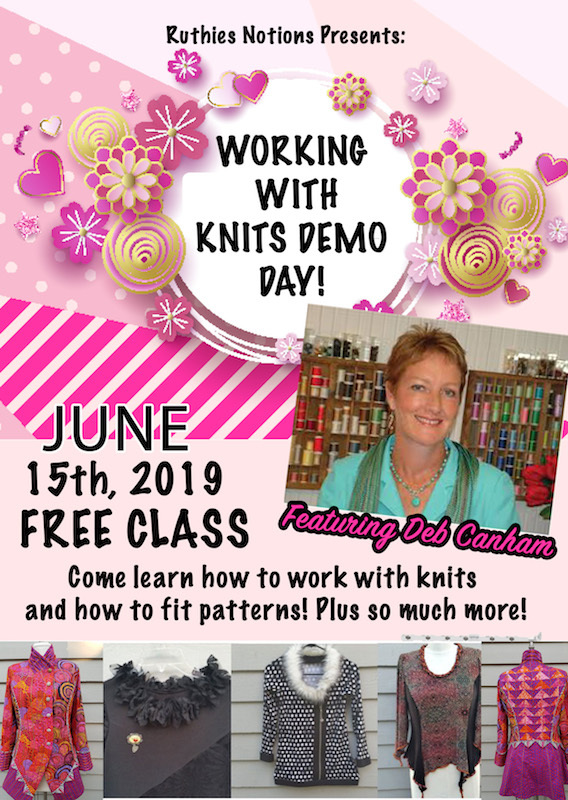 This will be a demo day working with Knits and how to fit patterns. Deb will be making a fitted t-shirt with bust adjustment, adding some fun variations; leggings and an easy Cocoon jacket which is the perfect gift for adults and grandchildren. She will be working with different types of knits and sharing her knowledge on how to fit patterns for both knits and wovens. Knits are fun and easy on the serger. This class is FREE! Sign Up Today! Learn new techniques: upcycle with lace, embroidery fringe, mylar applique, puffy foam, and more!! Everyone will receive a $200 gift! Plus, each day there will be a $400 door prize given away!! PLUS! Attendees will have a chance to win a FREE sewing machine to be given away on Saturday. This class is FREE and a catered lunch will be provided both days!! 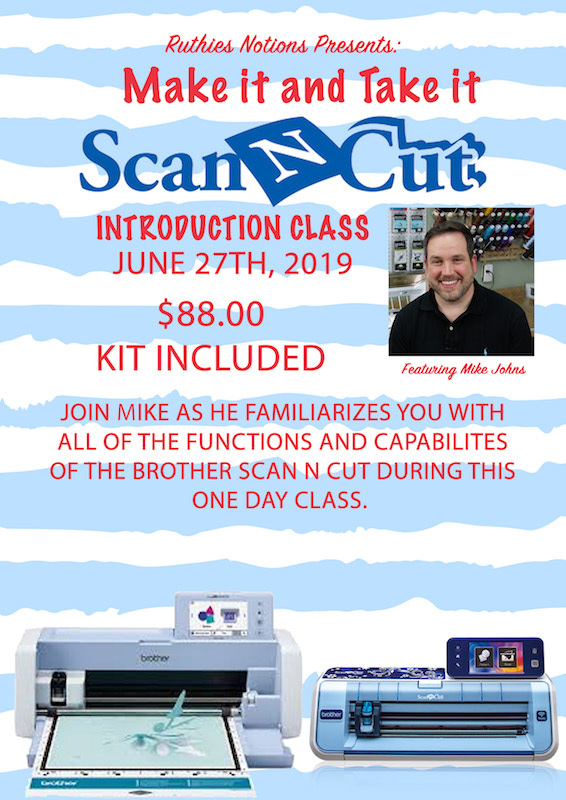 Join Mike Johns as he familiarizes you with all of the functions and capabilities of the Brother Scan N Cut during this one-day class. This is a beginner level class, but everyone is welcome. Attendees will bring their Scan N Cut, Cutting Mats, Cutting Blades, Weeding Tools (such as spatula and pick), and included Accessories for use in class. There is no need to bring a laptop as this class will be focused solely on the Scan N Cut machine and not software. The cost of the class is $88.00 and includes the kit and a fully catered lunch. How fun would it be to create an entire quilt without ever having to grab a pair of scissors or worry about achieving that perfect 1/4” seam? Well, that’s exactly what we are going to do in this class! 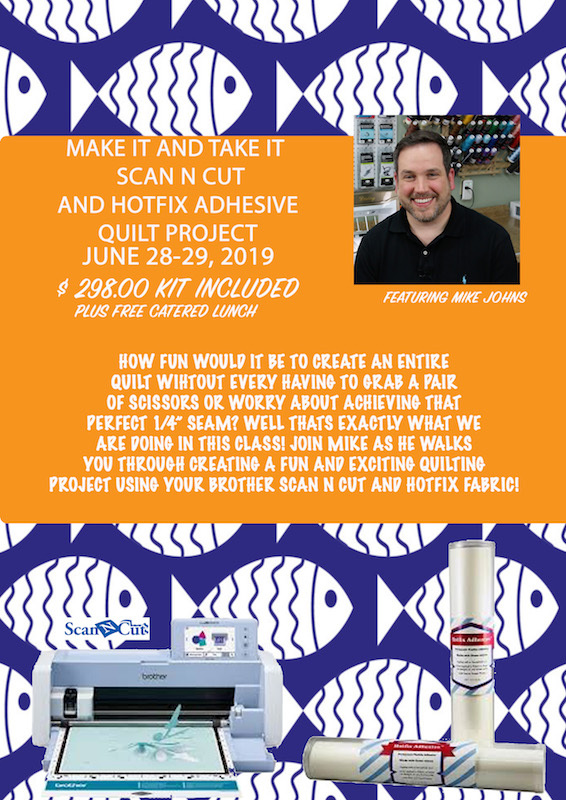 Join Mike Johns as he guides you through creating a fun and exciting quilting project using just your Brother Scan N Cut and HotFix Fabric. Each attendee will bring his/her Scan N Cut, a standard cutting mat (in good condition) and a cutting blade (also in good condition). Mike will provide each attendee with all the fabric and HotFix Adhesive needed to complete the project. The cost of the class is $298 and as always a delicious lunch will be provided each day. Seating is extremely limited, so be sure to reserve your space today!